The story of Austin Dabney continues... Austin Dabney's wound threatened his life and had it not been for the kindness and care of Giles Harris, a white fellow soldier, he probably would have died. In 1786, the state of Georgia granted Dabney 50 acres of land in recognition for his military service. Additionally, the legislature provided 70 pounds to emancipate Dabney from his owner, Richard Aycock. At this point Dabney was a free man but due to the kindness of Giles Harris, he went to work for the Harris family. Dabney became such close friends with the Harris family that he remained with them for the rest of his life and even supported their son, William, financially so that he could attend college and law school. William named his son Austin Dabney Harris in honor of Dabney and Dabney, upon his death, left all of his posessions to Harris. 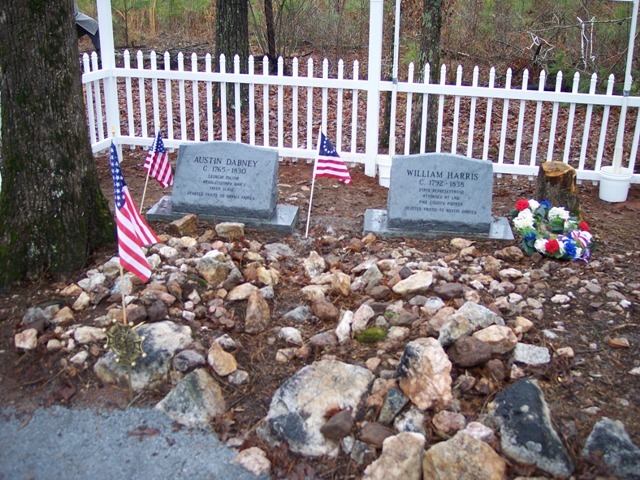 Dabney and Harris are buried side by side in the Harris family plot. This story of friendship that crossed all kinds of boundaries is just amazing. Indeed many thanks to the Harris family for helping to keep the story of Austin Dabney alive, long enough so that the National Society Sons of the American Revolution and the Georgia Society SAR could paid tribute and honor of this Georgia Patriot of the American Revolution who happened to have been the first man of color, so identified as having participated in the battle of Kettle Creek in 1779. I also admire GPBS - Georgia Traveler program for also sharing the story of Austin Dabney and his relationship with the Harris family. It is stories like these that help to expand the national narrative about those others who were often forgotten as having provided Patriotic service during the War of Independence. Georgia appears to have once again held the honor of paying tribute to yet two more Georgia Patriots with an amazing story. And once again, because of the remembrance of the Heard family concerning the Heroic rescue of Patriot and former Governor Stephen Heard. The story of Mammy Kate and Daddy Jack was able to be told. 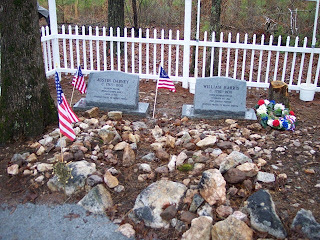 Their Patriot Grave Marking was recently held in the near by county of Elberton Georgia Oct 15, 2011. You may have to cut and paste links to information provided, hope you enjoy and are inspired by these stories of Patriotic Service by those nearly forgotten.